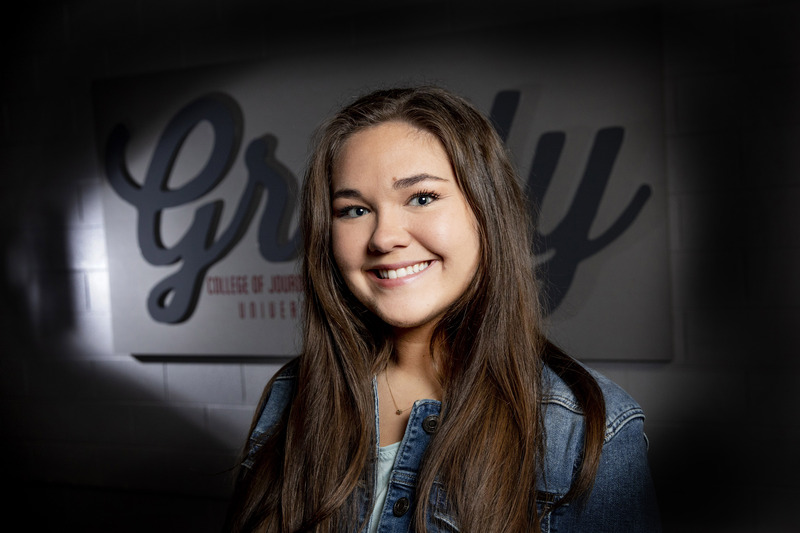 As a master’s degree student in emerging media, Caroline Windham is committed to connecting people through the media in a positive way and make them feel accepted. I am a graduate assistant for Dr. Keith Herndon and a master’s student in the Emerging Media Program, currently in its second year of operation and I’m thrilled to be a part of it! My grandfather played basketball here in between his military service. My dad and uncle both graduated from Terry College, so I was somewhat of a traitor choosing Grady College but I’ve been forgiven. My sister is about to start her sophomore year and two cousins both transferred in this past fall. To say it lightly, UGA is definitely a family affair! My aspiration is to work with different companies and brands as a content creator/analytics specialist, and my journey to that conclusion has allowed me incredible opportunities and invaluable connections. I have interned with Paste Magazine as a travel intern where I would edit stories submitted by writers and code them into the website, as well as posting on social media. My time at ba.agency showed me the inner workings of advertising, as well as the importance of collecting data for different customer projects. Getting to collaborate on projects with ICON graphic design agency (they designed all the graphics for the 1996 Olympic games in Atlanta) was such an interesting experience as well. Back in Athens, I have interned with a local yoga studio, M3, as a content creator specializing in graphics. There I was able to explore my love of graphic design and channel my creativity. As a student, I am a Zell Miller and Hope Scholarship recipient. I participated in Relay for Life serving on the Special Events Committee. Volunteering for the Guide Dog Foundation was a highlight of my UGA career, as I helped “buddy” dogs for their handlers. It was such a coincidence how much nicer and more social people became when I was on duty with a dog. A great support system and community for me was the UGA Wesley Foundation. There I participated in their Discipler mentorship program and loved the two girls I had the privilege of discipling. I completed the Entrepreneurship Certificate, but what got me interested in it was taking Entrepreneurial Journalism with Dr. Keith Herndon. I won the pitch competition for the class, and it sparked my interest in entrepreneurship. In my last undergraduate semester, a team I was in for class completed Idea Accelerator through Four Athens and it was an extremely intensive but rewarding accomplishment. I graduated with 60 people in high school, and was tired of everyone knowing my business by lunchtime. But in all seriousness, the Grady College really was so impressive to me and I knew that if I went through that program I would be able to reach my goals. I also knew when I stepped on campus it was just where I was meant to be; there is truly no other place like Athens. I obviously love going to football games, attending different festivals in downtown Athens, going to Wesley on Wednesday nights in Tate, and going to Ramsey (when it isn’t crowded). I enjoy relaxing by the pool with friends and catching up on my reading, trying out a new Athens restaurant, researching new media trends and markets, finding new photography spots, and of course watching a show on Netflix. I went to every away football game of this past season, in addition to home games. To say my weekends were booked is putting it lightly. It was tough balancing schoolwork with being gone every weekend, but I wouldn’t trade the experiences or quality time I had with my friends for anything and I couldn’t have picked a better season to do it! I would definitely say Jittery Joe’s — the Five Points location during the summer when it isn’t crowded, and east side during the school year. My favorite coffee by far! … Dr. Keith Herndon by a landslide. He was the one who really helped and encouraged me to pursue entrepreneurship, and is also one of the kindest people I know. He truly wants his students to succeed, and has definitely found his purpose in life. *Disclaimer* I’m going to be his graduate assistant in the fall, and I promise I’m not saying this to get on his good side, just meet him and you’ll see. … probably C.S. Lewis, as I loved “The Chronicles of Narnia” and his Christian apologetics books. Hearing his view on things in person would be even better than reading them. He was also BFFs with J.R.R. Tolkien and an INTJ like me. … start my own company in consulting for content creation. In entrepreneurship we learned that 50 percent of companies fail in the first year, and 70 percent in the first 10 years, so having that guaranteed would make everything else a breeze. As cliché as it sounds, definitely travel. From the time I was in elementary school, I’ve always been interested in Asia and that continent so I would want to start there and then go to as many places as I can. I just think it really makes someone more well rounded, and as Mark Twain said, “Travel is fatal to prejudice, bigotry, and narrow-mindedness.” I think we could all use a little more travel these days. For me, passion and purpose go hand-in-hand. Without passion your purpose becomes dull, and without purpose your passion fizzles out. I’m committed to pursuing my purpose of loving people and making them feel accepted. That’s what drives me, and I am passionate about doing that through media and connecting people. Media isn’t all bad, and I want to help people see the positivity and love available because that’s essential for a happy life. After my graduate school graduation, I plan to move to Atlanta and work in the media field as a media analyst or content creator. Getting to go to the National Championship game. Even though we lost, the energy was insane and truly made me proud to be a Georgia Bulldawg.